Announcement All my pieces are hand painted, and gourds are OOAK (one of a kind) None are ever duplicated. Gourds will last indefinitely. Barnwood can be duplicated. (see policies) INTERNATIONAL SHIPPING IS AVAILABLE. I hope you find what you’re looking for among these one of a kind works of art. Be sure to click on thumbnails or arrows. You can also view my sales. 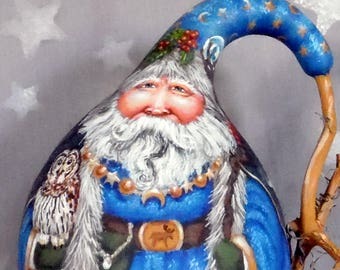 Santas, witches, pumpkin scenes, wildlife, steampunk and fantasy creatures such as wood gnomes. :) Shipping rate includes a small handling charge and post office drive (18 miles). For more information and answers to questions you may have, please read my profile and shop policies. Enjoy your stay! All my pieces are hand painted, and gourds are OOAK (one of a kind) None are ever duplicated. Gourds will last indefinitely. Barnwood can be duplicated. (see policies) INTERNATIONAL SHIPPING IS AVAILABLE. 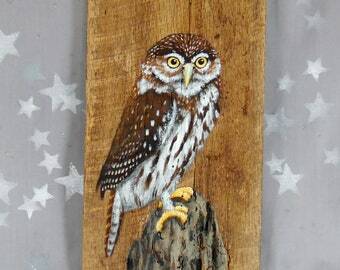 Western Screech Owl, artwork on Ozarks barnwood, 9 1/4” x 18 1/4"
Black Throated Blue Warbler, songbird, authentic barnwood, rustic, hand painted, 9 3/4" x 6 5/8"
European Robin, songbird, authentic barnwood, rustic, hand painted, 5 1/2" x 15"
Wonderful Steampunk Traveler - I intend to leave him out year round. I really love all of the artistry especially the sparkle wisp of smoke coming out of his pipe. Fast ship. Wonderful colors and detail as always. Thanks so much! Super cute snowman painted on this weathered wood. It's going to make a great gift! Super fast shipping was provided. Suzy's Santa's etc. is all about unique, one of a kind hand painted items. 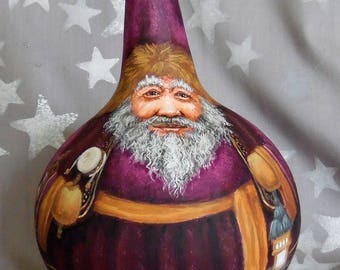 I've been painting and drawing pretty much all my life, and found a real gem in the world of gourds. 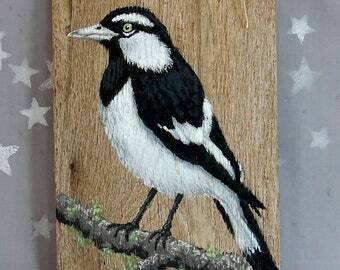 Each is intricately painted with loads of detail. 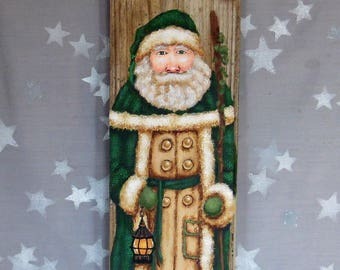 Santas are just one of the subjects I love to paint, but they are what started it all. 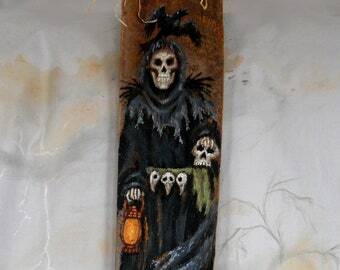 I have since begun painting on barn wood, a rustic alternative to the "canvas" that is the gourd. I have also begun experimenting with relief carving on gourds. Interesting! Keeping it to wood spirits for the time being. My world revolves around my art, but I love taking hikes in the woods or a nice walk down our country road. Hello, and welcome to Suzy’s Santas! I specialize in Santas, but also love Halloween, and do some wildlife and fantasy creatures such as wood gnomes, mother nature, and fairies. 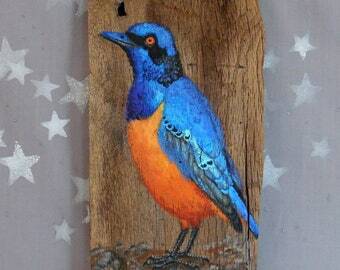 I have also added rustic barnwood art. PLEASE restrict your custom requests to Santas, wildlife, Halloween, or fantasy creatures. Feel free to browse my treasures. I hope you find what you’re looking for among these one of a kind, original works of art. Enjoy your stay! For more information, please read my profile and shop policies. I now accept PayPal, Etsy Payments, checks, and money orders. Please use PayPal, as this is my preference. Your item will ship after payment is confirmed and/or your check has cleared, up to two weeks, hopefully sooner! Using Etsy Payments may result in a shipping delay, whereas PayPal will ship as soon as possible with no delay. Shipping for barn wood is based on weight. Some boards are quite heavy, and additional boards are charged $3-4 each on a single order. My rate includes a small handling fee. I ship using USPS Priority mail when it doesn't break the bank. Larger boxes may be up to $25 higher for priority. Please let me know if you need your item by a certain date, but expect to reach deep into your wallet! I have a flat rate price of $16 - $18 for shipping for most gourds. Shipping has gone up, expect new, slightly higher rates. Oversized item rates may be higher. If the item is oversized, I cannot combine shipping due to box size limitations. Larger boxes are shipped Standard unless otherwise specified. Every box is a different size and weight. My rate includes a handling fee. I DO ship international, so contact me right away and I will reserve your item and get a shipping estimate, then add the appropriate country and rate for you. Be aware that shipping to another country may involve delays in customs, and possible additional fees. Customer would be responsible for any additional fees. I ship once a week, or as soon as I can find the proper box. No matter how many boxes I have, occassionally there is a size I don't have. Please allow 1 week, plus possibly a couple days for shipping once payment is confirmed. On occasion, it may take longer, but I do my best to get your order out in a timely manner. Gourds are packaged with great care. If you wish to have your gourd insured, there will be an additional charge of $2.25 for anything under $100, and $2.75 for anything over $100 up to $200. I’ve not had any problems, so it would be up to you. What are gourds? Hard shelled gourds are natural, (they grow on vines) and are found all over the world. They are related to pumpkins and decorative gourds. Gourds will basically last indefinitely. Samples of carved gourds have been found dating back to over 9,000 years. All gourds are at least one year old and have been thoroughly cured and dried, then cleaned and dried again for good measure. NO wholesale, NO discounts. Please do not ask for a lower price. I do not use coupons. Items are NOT for resale! 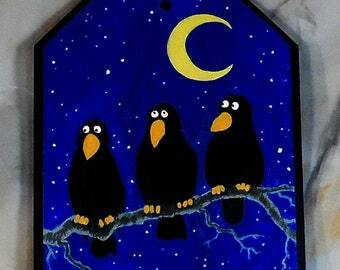 Nope, don’t do bird houses. Nope, don’t do commercial red and white Santas. No fancy packaging, I recycle plastic bags, end roll newsprint and boxes, along with packing peanuts. It saves the earth, and more importantly, it keeps your costs down. No, can’t guarantee a shape, each gourd is uniquely shaped by Mother Nature. Yes, I do fill small holes and some imperfections, but bumps, dips and flat spots are a natural part of the gourds. Barnwood is old and unique. Sometimes I run out of a particular width. They have knots, nail holes and cracks, giving them character. Some are rougher than others, so some will be less detailed of necessity. All gourds are signed on the bottom, along with the year and the title of the piece. Barnwood boards have a business card glued to the back rather than a signature, due to the rough surface. 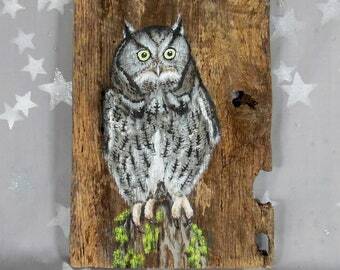 Yes, I will do duplicates of barnwood designs. IMPORTANT: Intellectual Property Policy on all artwork: Please ask if you wish to download images. Images are subject to copyright and intellectual property laws. DO NOT COPY. All art in my shop is unique and original. This extends to my original and unique style. I do not use patterns and do not sell my designs. Thank you.